KATHMANDU, March 6: Even after more than two years of the announcement of free birth services and an encouragement allowance to promote delivery at government hospitals, a survey has revealed that many women living in slum areas of Kathmandu are either unaware of it or reluctant to benefit from the free service. Of the total births in Kathmandu slums, 40 percent took place without medical assistance, according to the survey conducted in 2009\2010 by Kathmandu Metropolitan City (KMC). Such deliveries can lead to complications in the health of both the mother and the newborn. 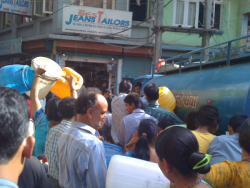 KATHMANDU, 24 September 2009 (IRIN) – Fetching drinking water is a daily ordeal for schoolgirl Sumitra Maharjan, who queues from dawn for hours to access a local public tap. “I often miss school, and this is badly affecting my studies,” said the frustrated 15-year-old, holding a blue water bucket and standing behind 100 other people. However, Maharjan is luckier than some – she manages to get water at least once a day. A large number of residents in Kathmandu have not seen a drop of water from their taps for months. “My tap has been dry for the last six months. You can imagine the crisis we are facing,” said a local resident, Ramesh Gurung. Most of Kathmandu’s drinking water comes from the Bagmati river system, which has seven streams in Kathmandu valley. However, the supply is insufficient for the city, which has a chronic water shortage. The government blames changing weather patterns – the country is counted as one of the most vulnerable to climate change – and a growing urban population. “The water shortage is worsening,” said Rameshwar Shrestha, spokesman for the Upatyaka Khanepai Limited (KUKL), a government body responsible for supplying drinking water to Kathmandu’s two million people. In Nepal, rainfall has become erratic, and winters have become drier in recent years. Last year, there was less rain than usual during the mid-year monsoon season, and the country also experienced a severe winter drought which stretched into 2009 – which meant not much water was stored. These factors affected the supply of drinking water both in and outside the capital, according to KUKL. Shrestha said there is a daily demand for at least 200 million litres in Kathmandu, but KUKL has only been able to supply 160 million litres. The capital’s main pipeline system is 100 years old and much of it has fallen into disrepair, according to local NGOs lobbying for water rights. The government has said that over 38 percent of the pipes are leaking, and it is often difficult to repair them due to a lack of funds, according to KUKL. But more than financial constraints, activists blame a lack of political will from the government to resolve the crisis. “We have been warning about the impending water disaster for years, and now the crisis has reached its peak,” said Lajana Manandhar, convener for the Fresh Water Action Network (FAN) Nepal, a national network of NGOs lobbying for water and sanitation rights and policy. For Kathmandu residents, the only alternative so far has been to extract groundwater. According to the NGO Forum for Urban Water and Sanitation, over 60 percent of households are already doing this by using home-installed electric pumps. The number of users is growing, leading to concerns about the over-exploitation of groundwater. “This resource will also dry out soon, because the depletion has already started with more people relying on groundwater,” Prakash Amatya, the director of the group, told IRIN. Groundwater is being depleted at an alarming rate, with the water level sinking an average of 2.5 metres annually, according to the government’s Ground Water Resources Development Board. Aid agencies and the government agree that the only solution to the water crisis is to implement the long-delayed Melamchi Water Supply Project . The project, estimated to cost US$317.3 million, is being financed by several international agencies and banks, including the Asian Development Bank (ADB), and the Japan Bank for International Cooperation (JBIC). The government is also contributing around $90.6 million, said officials. The project, launched in 2000, aims to supply water to Kathmandu through a 26km tunnel from the snow-fed Melamchi river in Sindulpalchowk District, northeast of the capital. However, political instability, and demands from local villagers, who said they were not compensated enough for use of their land to build the tunnel, have proved to be serious obstacles, according to NGOs. But the four-year project has been relaunched, and the agencies involved are hoping the tunnel can be built. “This is really badly needed, because Kathmandu as a city has a chronic water shortage,” Barry Hitchcock, the ADB’s country director for Nepal, told IRIN. “In four years’ time, when water starts coming out of the pipe, there will be a new water facility attached to that, and we will be in a better position to deliver water to the population,” he said. KATHMANDU, Dec 9 – Water Tariff Fixation Commission is likely to hike water tariff by 10 to 30 per cent this week, even as the Kathmandu Valley continues to face a perennial shortage of water. Kathmandu Upatyaka Khanepani Limited (KUKL), the public-private partnership utility responsible for the distribution of piped water in the Valley, had proposed hikes in water tariff last week. “The proposed hike does injustice to the urban poor. This will force them to pay three times more tariff than the rich or those who have private taps,” chief executive director of NGO Forum for Urban Water and Sanitation, Prakash Amatya, said. “If the proposed tariff takes effect, the community tap users will have to pay Rs 205.80 for consuming 10,000 litres of water. This includes sewarage charge. On the other hand, private tap owners will have to pay only Rs. 82.50 for consuming 10,000 litres. Urban poor’s right to water will be in jeopardy if the commission gives a go-ahead to the proposed water tariff hike,” he said. Earlier, a KUKL official claimed the proposed hike tariff was in line with recommendation of Asian Development Bank (ADB), the main donor for Melamchi Water Supply project. This time, however, no one was available for comment on the proposed water tariff hike.